2018 Two-Stroke Genuine Mopeds are Approved! Genuine is committed to keeping America’s favorite 50cc two-stroke mopeds on the road in Hawaii. We are excited to announce that Genuine Scooter Company has already received approval for their 2018 two-stroke models. This is one of the many reasons why we exclusively rent and sell Genuine mopeds. Please visit sales.hawaiimoped.com to pre-order your new 2018 ride today. We will also be offering the Titanium Buddy, Limited Edition Lavender Buddy and the Roughhouse Sport for sale. All our new models will be backed by Hawaii’s best two-year unlimited mileage warranty and free roadside service. Our used Genuine mopeds come with a one year unlimited mileage warranty. Genuine Scooters are the Best! It’s official. Today, we finally sold our last SYM moped. We’ve been phasing out SYM slowly, while incorporating the Genuine line of mopeds into our fleet. In May, we sold our last DD50 moped and today we sold our last Jet Evo moped. Since we rented the SYM mopeds and Genuine mopeds together during this transition, we were able to compare them every day. We’ve found that Genuine is just as bulletproof as the SYM. They require the same maintenance, because they are both two-strokes, but the Genuine moped maintains its good looks much longer. The Genuine Buddy and Roughhouse are made out of higher quality parts, which makes our used mopeds continue to look new when we put them up for sale. Almost all of our sales customers can’t tell that our used mopeds are not new at first glance. We never had the same experience with the SYM line. Unfortunately, a used SYM looked like a used moped. Say Aloha to SYM two stroke mopeds. SYM announced they were discontinuing production of the SYM DD50 and Jet Evo after 2015. When starting Hawaiian Style Rentals out of the back of the pickup truck in 2005, we bought the cheapest, coolest-looking mopeds. We learned quickly that “you get what you pay for,” and were plagued with unhappy customers and countless, unavoidable service calls. SYM was already an option in the marketplace, but we wanted something different that looked fun to ride. The SYM DD50’s simple clean lines didn’t appeal to us at the time, so it took two years of being in business and many headaches to make the switch. Once we did, we never turned back. For eight years, we proudly exclusively rented, serviced, and sold the SYM brand on Lemon Road. They were high quality, and we never experienced the same issues that are inevitable with a Chinese off-brand moped. We added the Jet Evo, Rv200, and HD200 into our fleet, and experienced similar quality and craftsmanship. SYM had a large portion of moped marketshare in Hawaii, so we were floored when SYM in Taiwan announced that they would be discontinuing the DD50 and Jet Evo at the end of 2015. SYM wasn’t selling enough of these models throughout US and the EPA raised their emission standards and testing for two-stroke motors, so they decided to discontinue these models and focus on their four-stroke motor production out of their Chinese factory. At Hawaiian Style, we aren’t ready to switch over to a four-stroke moped. They require more maintenance, and local people understand that a two-stroke moped is going to provide much more power than a four-stroke motor. Genuine Scooter Company in Chicago, Illinois is the last remaining company producing two-stroke mopeds produced in Taiwan. They have over 200 dealers nationwide and already have 2016 approval for all of their 49 cc two-stroke moped models. 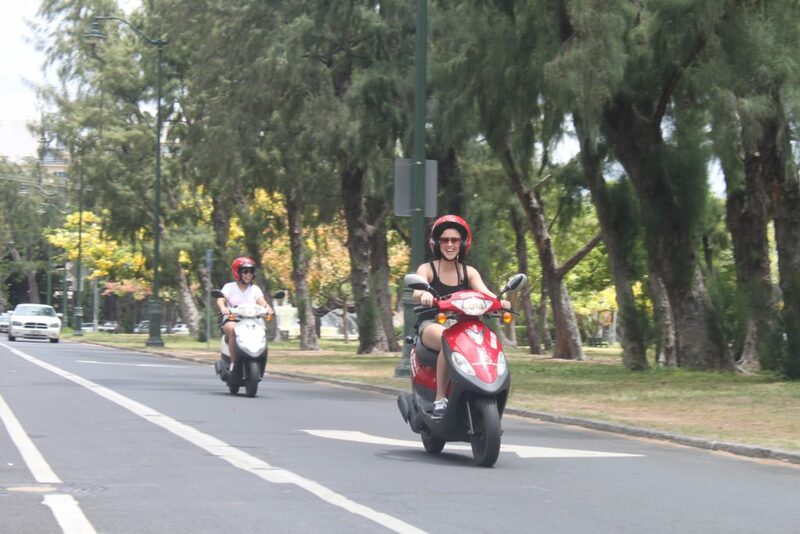 Shortly after contact, Hawaiian Style Rentals & Sales signed an exclusive dealership agreement for Oahu and had their first container of Buddy mopeds delivered in August. The fun, European look brings a fresh look to the fleet, and Genuine’s commitment to quality and dealer success may be even better than what we are used to with SYM. Only time will tell. Expect to see these colorful mopeds riding around the island. Once rental tested and approved, we will sell them used with our one year unlimited mileage Hawaiian Style Warranty. Beginning next year, we will sell our new models with a two-year unlimited mileage warranty and roadside service. 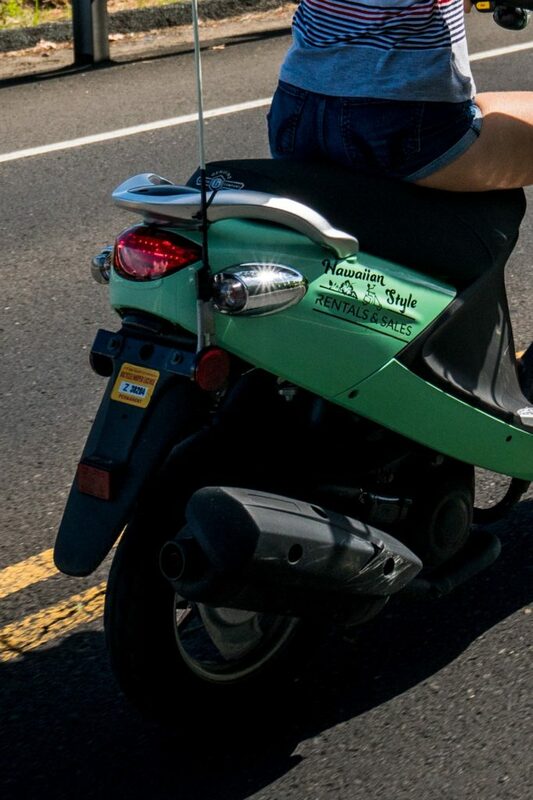 We hope that the Buddy 50 can become Hawaii’s new favorite moped! © 2017 Hawaiian Style Rentals. All Rights Reserved.